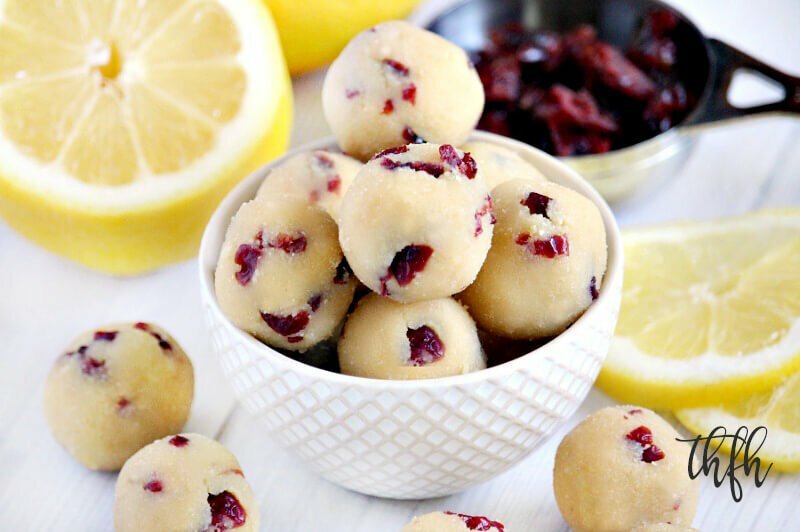 These Gluten-Free Vegan No-Bake Cranberry Lemon Balls are an upgrade from the Raw Vegan Lemon Meltaway Balls recipe on my website, which is a reader favorite here at The Healthy Family and Home. In fact, it’s been almost 5 years to the day that the original recipe appeared on my website (5-9-13) if you can believe that! So I added organic dried cranberries to the original recipe to give these classics a tangy and colorful twist. 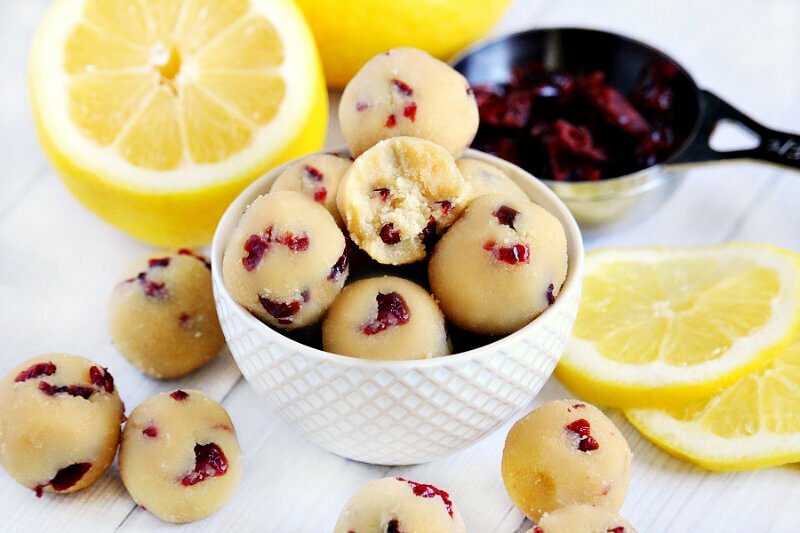 If you haven’t already made the Raw Vegan Lemon Meltaway Balls recipe (do so right away! ), it’s really simple to make. It’s the same exact recipe as this one, except without the added cranberries. 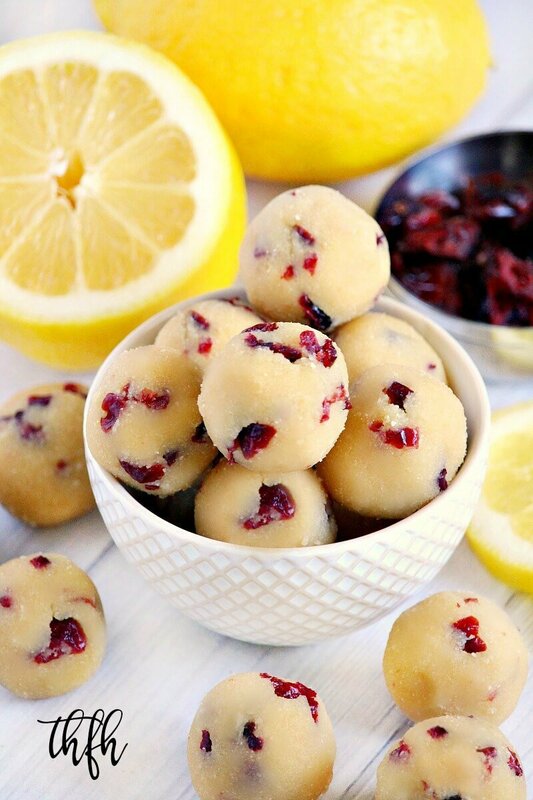 All you need to do is add all the ingredients to a food processor, process the mixture, stir in the cranberries by hand, then roll the mixture into bite-sized balls. Add them to the refrigerator to firm for 15-30 and you’re ready to go! Keep these in an air-tight BPA-free container in the refrigerator for a quick breakfast treat or an afternoon snack. This healthy dessert is made with real, clean food ingredients and is raw, vegan, gluten-free, dairy-free, soy-free, egg-free, no-bake, paleo-friendly and contains no refined sugar. Want more healthy ball and truffle recipes? Check out Gluten-Free Vegan Dried Blueberry Protein Energy Balls, Crunchy Raw Vegan Protein Balls, Lectin-Free Vegan Tahini Brownie Truffles or my Clean Eating Cookbook with an entire chapter of 20 healthy, clean eating ball and truffle recipes just like this one that you will love! Add all ingredients for the balls to a food processor and process until everything is well combined. The mixture should have a smooth and thick consistency, like raw cookie dough. Add the chopped dried cranberries to the mixture and stir-in by hand until they are evenly distributed. Test the mixture by taking out a spoonful to see if it's firm enough to roll into a ball shape. Depending on the type of sweetener you use, you may need to let them firm a little in the refrigerator before rolling into a ball. If they aren't firm enough to roll into a ball shape, put the mixture in the refrigerator for about 10-15 minutes, then remove and proceed to Step 4. Take a spoonful at a time and roll them into the palms of your hand to form a ball shape. If they start to stick to the palms of your hands, just rub a tiny amount of coconut oil on your palms and continue. Place the balls on a baking pan lined with parchment paper and place in the refrigerator for about 15-30 minutes to firm. Store in an air-tight BPA-free container in the refrigerator until ready to serve because they will get soft and lose their shape if left out at room temperature. The recipe and photographs for "Gluten-Free Vegan No-Bake Cranberry Lemon Ball Truffles" by Karielyn Tillman of The Healthy Family and Home website are licensed under a Creative Commons Attribution Non-Commercial No Derivatives 4.0 International License and cannot be used without my written permission.